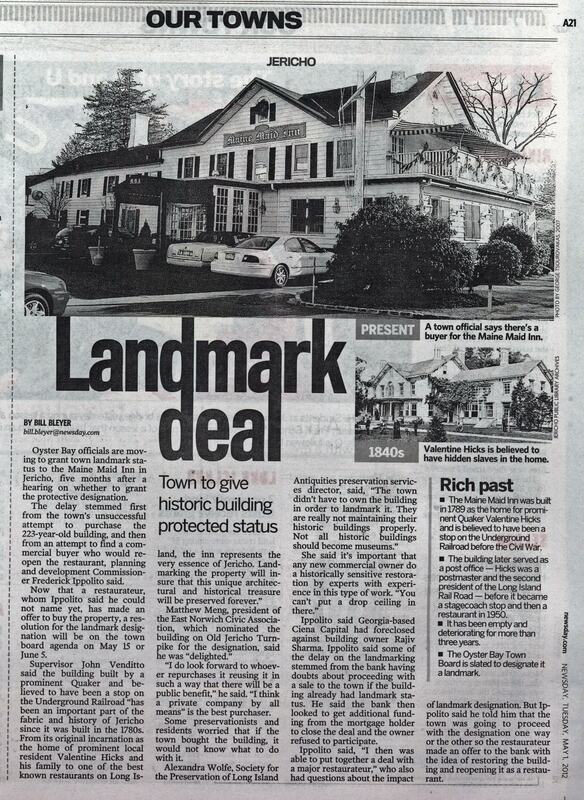 Reporter Bill Bleyer reported in Newsday today that the Oyster Bay Town Boardhas designated the Maine Maid Inn as a landmark. Built in 1789, this building was on part of the 1908 Vanderbilt Cup Race course. 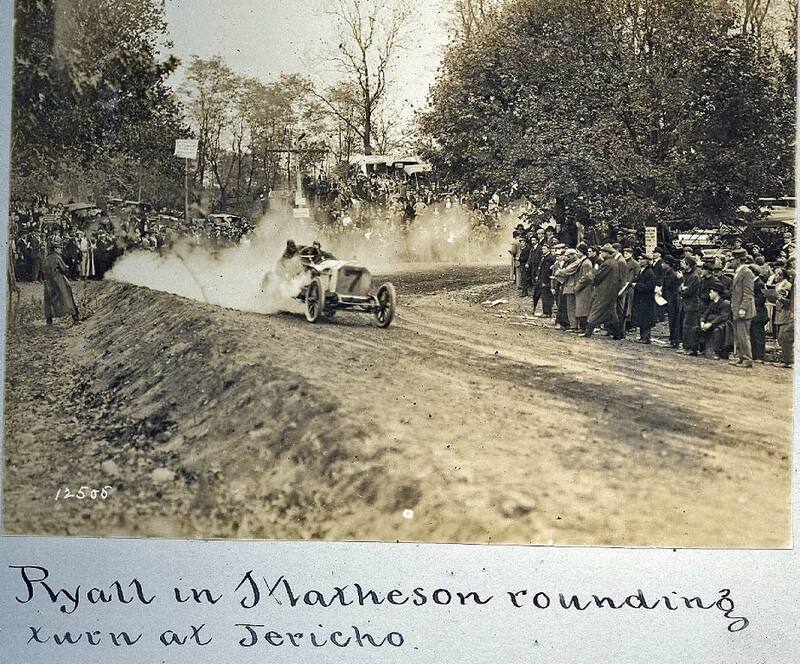 To celebrate this upcoming designation, below is the Newdsay article with Jericho photos from the 1908 race. To the applause of preservationists, the town board approved the designation for the colonial farmhouse with a connection to the Underground Railroad. The listing prevents demolition without approval of the town. In more good news for the historical community, Supervisor John Venditto said there are now two restaurateurs, who do not wish to be named publicly yet, interested in buying the building, restoring it to meet historic preservation guidelines and reopening it as an eatery. "This really touches the history of Long Island far beyond the township," East Norwich Civic Association president Matthew Meng said before the unanimous vote. The association nominated the building on Old Jericho Turnpike for the designation. "As long as that building stands, it will be a great example of the good things that can happen when residents . . . work together with a town government that is responsive," Venditto said. Planning and development Commissioner Frederick Ippolito said after the meeting that Georgia-based Ciena Capital, which owns the property after foreclosing on the mortgage, had turned down the offer from the first restaurateur as insufficient. Ippolito added that he hopes to negotiate a compromise deal between the bank and the restaurateur. He said the second restaurateur was waiting to see what happens with the initial bidder before making an offer to the bank. The Maine Maid Inn was built in 1789 as a home for prominent Quaker Valentine Hicks and is believed to have been a stop on the Underground Railroad before the Civil War. The building later served as a post office -- Hicks was a postmaster and the second president of the Long Island Rail Road -- before it became a stagecoach stop and then a restaurant in 1950. It has been empty and deteriorating for more than three years. The town denied landmark status in 1980 but said more documentation of its historic role has surfaced in the interim. Oyster Bay officials are moving to grant town landmark status to the Maine Maid Inn in Jericho, five months after a hearing on whether to grant the protective designation. The delay stemmed first from the town's unsuccessful attempt to purchase the 223-year-old building, and then from an attempt to find a commercial buyer who would reopen the restaurant, planning and development Commissioner Frederick Ippolito said. Now that a restaurateur, whom Ippolito said he could not name yet, has made an offer to buy the property, a resolution for the landmark designation will be on the town board agenda on May 15 or June 5. Supervisor John Venditto said the building built by a prominent Quaker and believed to have been a stop on the Underground Railroad "has been an important part of the fabric and history of Jericho since it was built in the 1780s. From its original incarnation as the home of prominent local resident Valentine Hicks and his family to one of the best known restaurants on Long Island, the inn represents the very essence of Jericho. Landmarking the property will insure that this unique architectural and historical treasure will be preserved forever." Matthew Meng, president of the East Norwich Civic Association, which nominated the building on Old Jericho Turnpike for the designation, said he was "delighted." "I do look forward to whoever repurchases it reusing it in such a way that there will be a public benefit," he said. "I think a private company by all means" is the best purchaser. Some preservationists and residents worried that if the town bought the building, it would not know what to do with it. Alexandra Wolfe, Society for the Preservation of Long Island Antiquities preservation services director, said, "The town didn't have to own the building in order to landmark it. They are really not maintaining their historic buildings properly. Not all historic buildings should become museums." She said it's important that any new commercial owner do a historically sensitive restoration by experts with experience in this type of work. "You can't put a drop ceiling in there." Ippolito said Georgia-based Ciena Capital had foreclosed against building owner Rajiv Sharma. Ippolito said some of the delay on the landmarking stemmed from the bank having doubts about proceeding with a sale to the town if the building already had landmark status. He said the bank then looked to get additional funding from the mortgage holder to close the deal and the owner refused to participate. Ippolito said, "I then was able to put together a deal with a major restaurateur," who also had questions about the impact of landmark designation. But Ippolito said he told him that the town was going to proceed with the designation one way or the other so the restaurateur made an offer to the bank with the idea of restoring the building and reopening it as a restaurant. 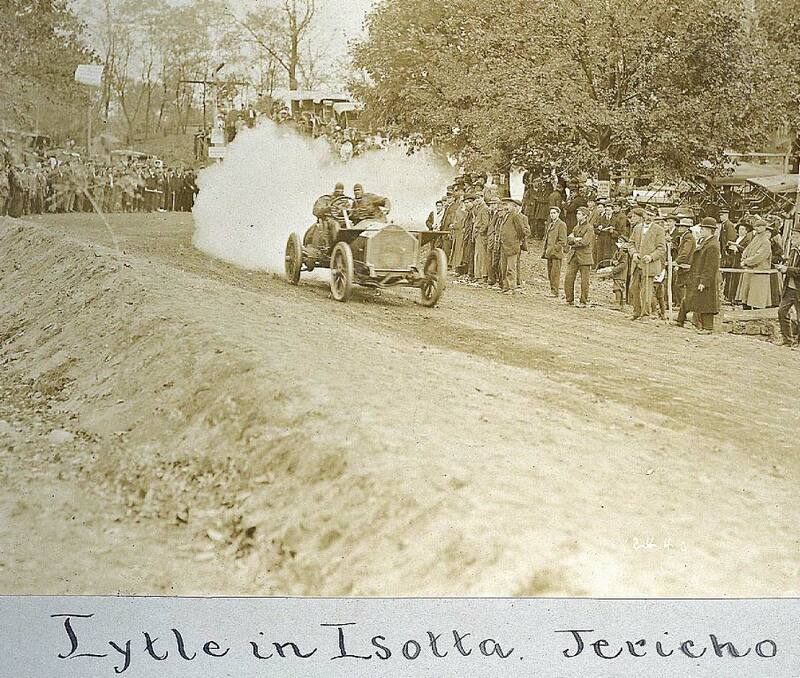 The #6 Isotta turning the corner at Jericho Turnpike. I believe the building that became the Maine Maid Inn was to the right. 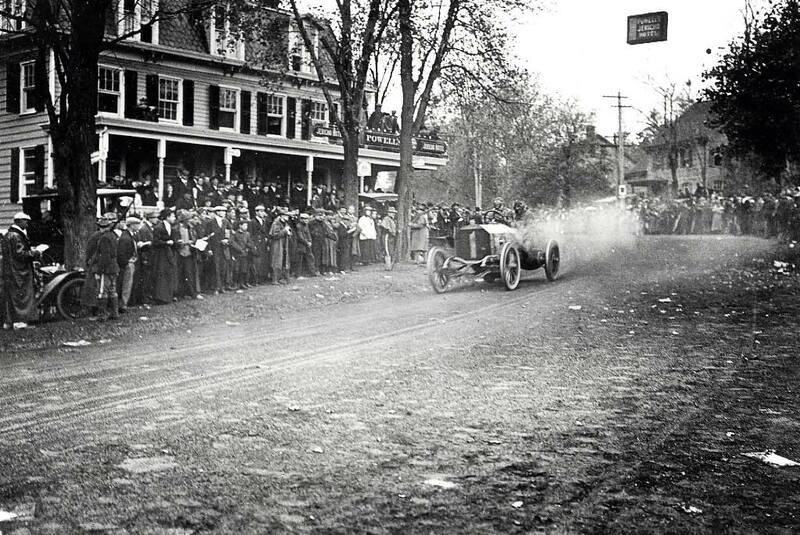 "Old 16" Locomobile on its way to win the 1908 Vanderbilt Cup Race. 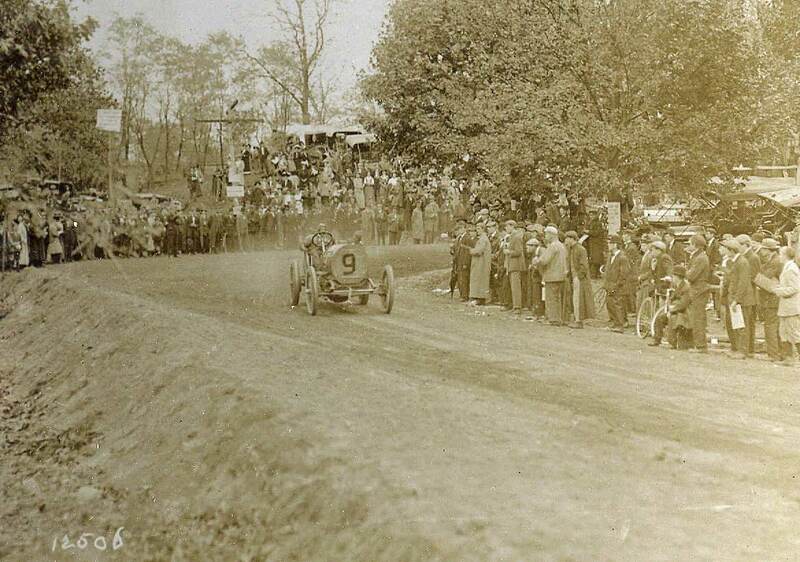 The #7 Matheson in Jericho before it caught fire in front of the grandstand. 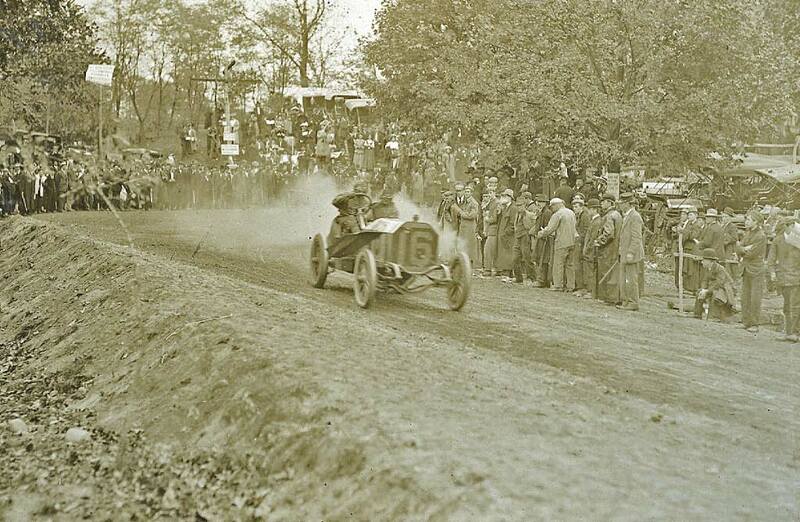 The #9 Hotchkiss taking the JerichoTurnpike Turn. 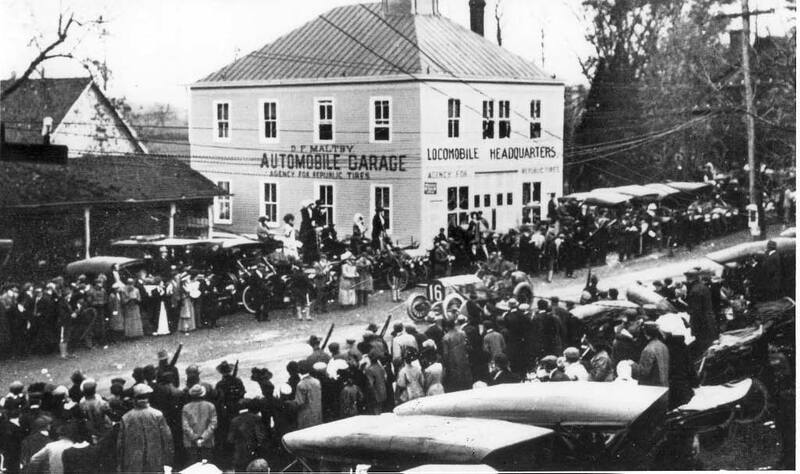 "Old 16" Locomobile passing its headquarters in the hamlet of Jericho just south of the Maine Miad Inn. The building later became the home of the Jericho Fire department. 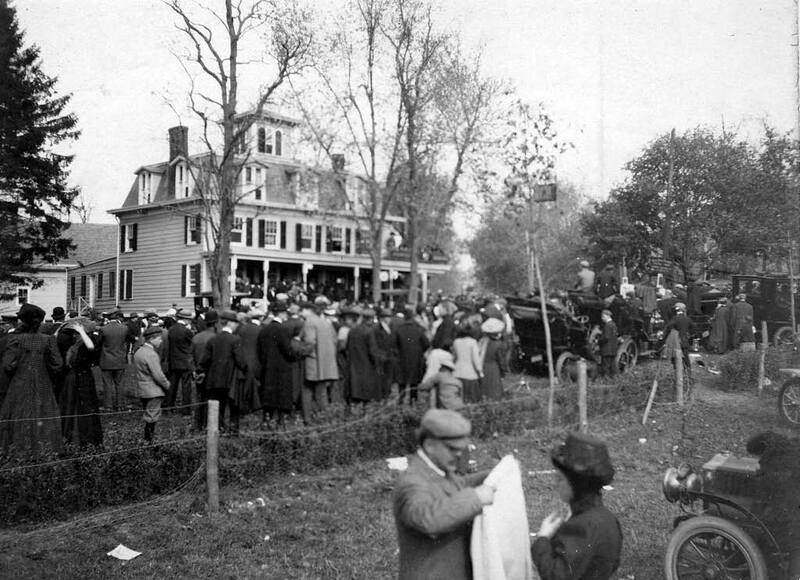 The #1 Lcomobile passing Powell's Hotel on Jericho Turnpike. 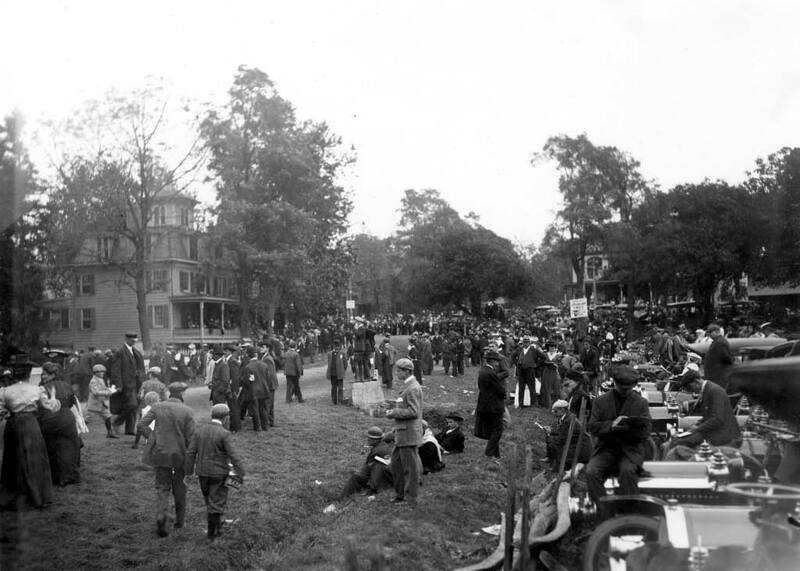 Over 2,500 spectators viewed the race in the heart of Jericho. It’s too bad I didn’t take a photo of the intersection of the Jericho Turnpike and Broadway-106-107 as it was being improved years ago; on the north-east corner was a hand-painted wooden sign with an arrow pointing to the right and crudely lettered “TOMAINE MAID”!